There is only a few days left to sign up for our introductory robotics workshop at the end of the month! Have you always had an interest in making things move and think? Are you tired of making your Arduino just blink LEDs? Our newest workshop will give you hands on experience on the fundamentals of robotics. We will cover many topics that may change the way you view everyday devices that you take for granted. In just 2 and half hours you will get to assemble your own Line Following robot kit and learn how simple machines use sensors to react with the world around them. 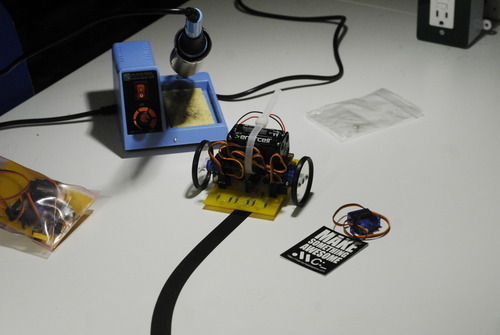 This workshop is designed for both new comers and people with hands on robot experience already. For the class fee of $60 we provide the robot and all the tools. The only thing you need to bring is some soldering experience. If you have taken one of you soldering workshops then you should be good to go! ( if not just ask us how you can prove your soldering worthiness ). Seating is very limited so give us a call at (206) 357-9406 and one of our LabCoats will be happy to reserve your seat over the phone.